Enjoy the natural stripes and tone variations with this pink catseye cufflink set. Each of the cufflinks are square and mounted in a solid silver-rhodium frame. This set is proof that you don't have to spend a lot to look great. It's a nice bright accent to a darker outfit and is the perfect piece4 that you need to finish off your outfit. Add it to your collection of cufflinks and break it out for those few special outfits that it matches really nicely. Enjoy the durability and the bright appearance of this set. It comes with a warranty for reliability and is designed for long-term use. 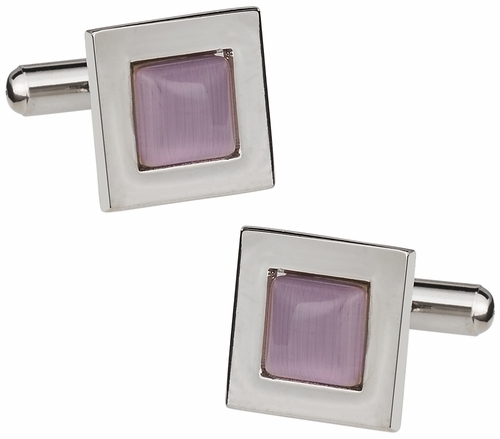 These gem looking cufflinks would go perfect with any pink jewelry you might have. It has a very nice pink crystal in the middle.